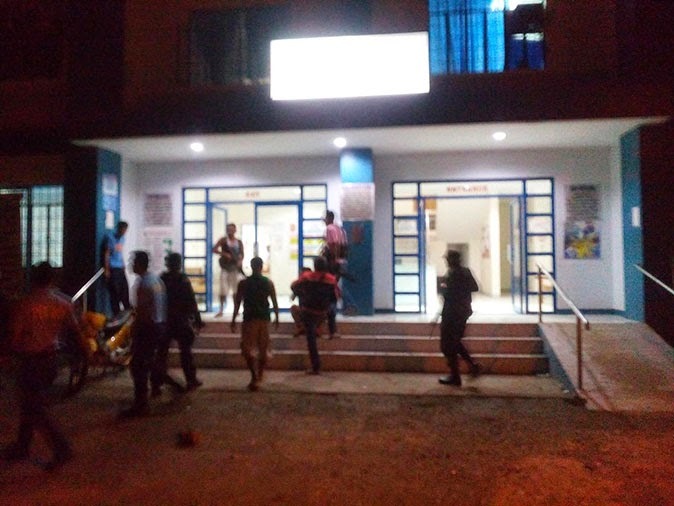 The Mati City Police station in Davao Oriental province was attacked by at least fifty heavily armed men around 7 p.m. Sunday, February 15. The desk officer on duty told local broadcast journalist Birador ng Bayan that the armed men, believed to be elements of the New People's Army (NPA), suddenly entered the station and told him to drop. After a short while, he was asked to stand up and was used as human shield so they can go up the second floor of the building. However, the cop was able to get free from the group that held him. After which an exchange of gunfire occured and lasted almost thirty minutes. The armed group reportedly retreated after their attempt to overrun the station was thwarted by brave policemen. However, their blocking force simultaneously attacked the Philippine Army from the 701st Infantry Brigade stationed in Sitio Magay, Barangay Don Martin Marundan of the said city. The PNP Provincial Station at the baracks in Barangay Dahican and the Lupon Police Station were also reportedly attacked. All these attacks are under investigation, according to public affairs radio talk show host and former city councilor Alan Andrada. A reliable source from the municipality of Lupon told Coolbuster.net that the town's police station was not attacked. One unidentified person, who is believed to be among the group who attacked as he had bullets with him, was seen lying on the ground, lifeless. According to Birador, one police officer was wounded after he engaged in a gunfight with the armed group near the Davao Oriental Electric Cooperative (DORECO) building. He was rushed to the hospital. A soldier from the Philippine Army identified in the report as Corporal Andres Luconan, who was driving a motorcyle, was also reportedly fired at after being confronted by the armed men at a roadblock in crossing Sudlon. Local reports said one was killed in action and five others were wounded after landmines exploded while the armies were on their way to the police station to reinforce. An elf truck, some improvised explosive devices (IEDs), and backpacks were left by the armed group, the report stated. In a separate post, Birador ng Bayan confirmed that two Army soldiers and four members of the NPA were pronounced dead.